Caldeco Air Conditioning & Heating is proud to offer Tampa Bay area home- and business owners with ductless air conditioner systems, installations and more. We are the hometown HVAC experts, and our staff is comprised of some of the area’s most skilled and knowledgeable technicians. Whether you are interested in a new ductless air conditioner to add cooling to a recent addition, or need a new AC system for your older, historic home, we can help! A ductless AC system is an affordable alternative to traditional duct systems and also more reliable than a standard window AC unit. 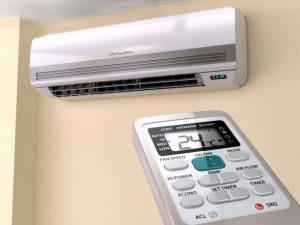 Unlike most window units that are available on the market today, a ductless AC system works through the use of an indoor, mounted wall unit and an exterior compressor, both of which connect through a small hole in the wall. As such, they are not prone to the same energy-loss that is often seen with window units and generally do not require as much expense and maintenance as installing a new AC System. In addition to AC system sales, installation, repairs and service, we are also pleased to offer HVAC cleaning to residential and commercial customers alike. Residents and commercial property owners can choose from our exemplary duct cleaning and sealing services or enjoy consistent HVAC cleaning as part of a scheduled maintenance plan. Each of Energy-Saving Maintenance Agreements includes the thorough cleaning of system components such as the primary drain, drain line, blower assembly, indoor coils, outdoor coils and more. If you own a home or business in Tampa, Wesley Chapel, Brandon, Westchase, New Tampa or the surrounding cities and are interested in determining whether a ductless air conditioner is right for you, want to schedule HVAC cleaning services, or have any other heating or cooling needs, contact the experts at Caldeco Air Conditioning & Heating today for more information.